There are different schools of thought on how prepaid utility services are best provided. Some argue that the tried-and-tested ‘thick’ meter approach is all that’s needed, while others advocate that using smart meters gives utilities the flexibility to open up prepayment to new customer segments and spur its adoption as a lifestyle choice. So how do the alternative methods of providing a prepaid service stack up? We asked leading industry experts on prepayment to give us their views. Sign up for our newsletter to receive a free pdf copy of this feature! Traditional thick metering – using specially designed prepayment meters to measure consumption, apply tariffs, calculate the customer’s balance and disconnect supply when there is no more credit. This approach has been used in traditional prepayment markets such as the UK and is also being rolled out widely in developing countries as a way of increasing revenue collection and avoiding estimated billing. Thin smart metering – using smart meters equipped with remote disconnect / reconnect capability and back-office software systems to operate a prepayment service. With a back-office driven prepayment solution, the meters can be operated in either prepaid or postpaid mode. The thin prepayment approach is most evident in the US, where many utilities that have deployed advanced metering infrastructure (AMI) have started to introduce prepay as an alternative payment method. Thick smart metering – like the traditional systems, thick smart meters perform most of the calculations on the meter but can also take advantage of AMI communications capabilities to enhance the prepayment service. The smart metering roll-out in Great Britain (GB) will use thick smart meters. In the traditional approach, a dedicated prepayment metering system is used to provide the functionality needed for a prepayment service. As well as measuring consumption per interval, the meters incorporate additional firmware that allows them to rate the customer’s usage against tariffs defined in the meter and then calculate a real-time balance. Disconnection, which is activated by the meter, occurs when a customer’s credit runs out. To avoid this happening unexpectedly, modern thick prepayment metering systems are designed to keep customers informed of their balance position, for example by showing consumption and balance status on an in-home display (IHD) that communicates wirelessly with the meter, and by giving visual (e.g. traffic light) signals or audible warnings when the balance is low. There may also be policy measures in place to prevent disconnection out of office hours (such as ‘friendly credit’) and a small amount of emergency credit that the customer can activate on the meter to tide them over until they can recharge their account. Any friendly or emergency credit is repaid when the user next tops up. In the past, topping up meant a trip to a physical vending point such as a utility banking hall, post office or local store. The customer then uploaded the credit purchased directly onto their meter, using a physical token or swipe card or by entering a digital vending code via the meter’s keypad. With keypad meter systems, utilities can extend the range of payment channels by enabling customers to obtain digital vending codes via methods such as SMS or online. This reduces the reliance on the physical vending networks and provides greater convenience for customers. With key or Smart Card token prepayment systems, a meter reading is returned to the vending system each time the customer recharges. However, this is not the case with STS token systems, for which periodic meter readings must be obtained. 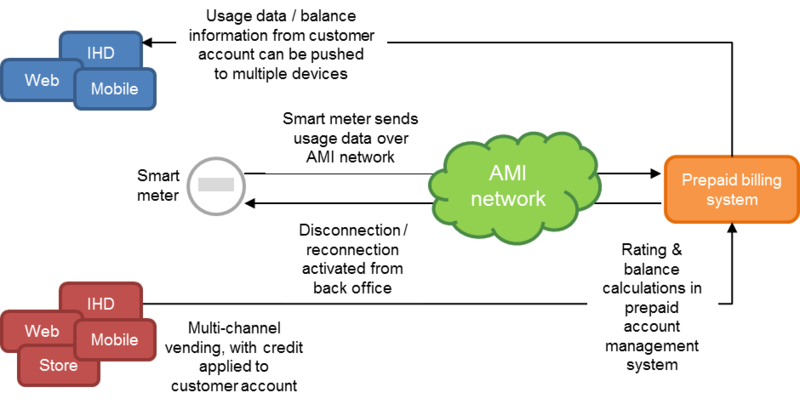 With the advent of smart meters, a new approach to providing a prepayment service has come to the fore, especially in the US where AMI is already widely deployed. In this so-called ‘thin’ smart meter based approach, centralised back-office systems rather than the meter are responsible for managing the prepayment service. Tariffs are defined in the prepaid account management system / prepaid CIS, which rates the customer’s consumption based on usage data obtained from the smart meter over the AMI network and then calculates the user’s balance. This is a fundamental difference from thick systems where the balance calculations are done on the meter. 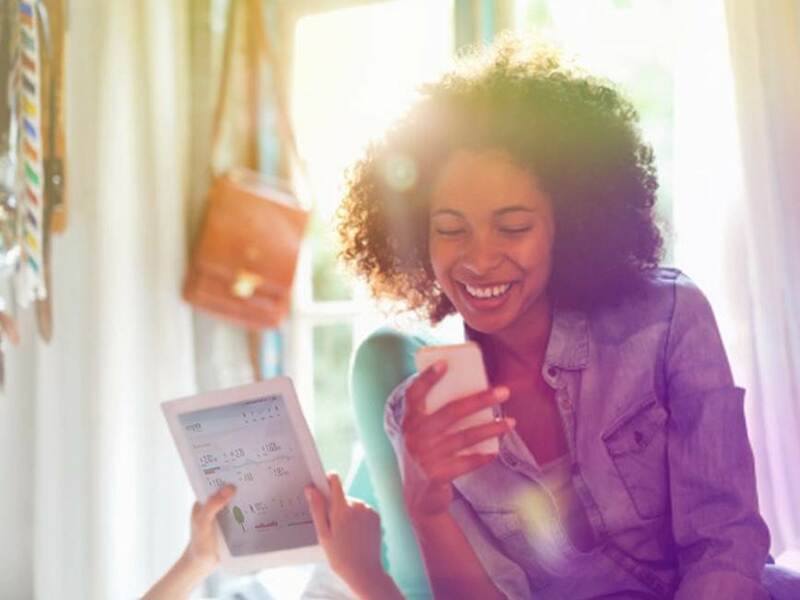 Utilities can push the centrally held customer usage data and balance information to a variety of end-user devices, including IHDs, web portals, mobile phones or tablets. In the US, customers are typically updated about their account status on a daily basis. The smart metering system also allows new tariffs to be applied across the prepaid customer base from the utility back office. Disconnection is triggered from the back office when credit expires, provided that the smart meter supports remote disconnection and reconnection. Just as with thick metering, utilities can apply policies to restrict when disconnection can occur. Customers can recharge their accounts in a variety of ways, including online, using SMS or smartphone apps as well as at physical vending points. Prepayment service can also be delivered using thick smart meters, which like their traditional counterparts keep most calculations on the meter and disconnect the supply when credit runs out. Such meters enhance the traditional thick approach in various ways. For example, purchases can be uploaded automatically to the meter over the wide area communications network. Should there be a failure in communications, the customer can fall back to entering a vending code manually, for example via an IHD. Thick smart meters such as those envisaged for the GB smart meter roll-out can also be switched by the supplier between prepayment mode and postpaid billing as required, so that, just as with thin prepayment, there is no longer a need for dedicated prepayment meters. With thick smart meters, tariffs can be updated from the back office, but the process is a little different from the thin metering approach as it requires new firmware to be downloaded to the meters. We asked a number of industry experts to give us their views on the different approaches to delivering a prepayment service. “There are clear benefits of a thick smart metering system,” according to Jim Shields, Head of Sales for Secure Meters (UK). Secure Meters has a 15-year heritage of deploying prepayment systems, including the first-ever online keypad pay-as-you-go system in Northern Ireland, which now supports around 40% of domestic electricity customers. Secure Meters’ whole approach to prepayment is very customer-centric and the company has been instrumental in introducing concepts such as friendly credit, as well as ensuring that customers have the information they need to manage their energy usage. “With keypad meters and smart pay-as-you-go it is easy to see where you are and take decisions about your consumption,” said Shields. “Coupled with friendly credit and emergency credit, self-disconnection should be a rarity,” he added. Shields continued that the advantages of having a “thick” smart metering approach where the business logic and current settings reside in the meter outweigh those of a “thin” approach where the business logic is completely dependent on receiving instructions from the communications network. “The thick approach lets the consumer have accurate and up-to-date information stored in the meter and immediately available via an in-home display. These advantages extend to both the customer and the energy retailer, giving customers control, as well as reducing the need to communicate with the meter more frequently,” Shields explained. In Shields’ opinion, thick pay-as-you-go has the potential to deliver a lower total cost of ownership than a thin smart system. For example, there may be potential savings as a result of the simpler back-office systems requirements compared to smart metering systems that rely on centralised processing at the back office. US-based Exceleron Software provides a web-based account management solution that allows utilities to leverage their AMI deployments to offer prepayment programs with no additional hardware. Craig Hutson, Exceleron’s CIO, sees several advantages of a thin metering solution, starting with the customer enrolment process. “A thin meter approach allows the existing meter to be used without modification, assuming a two-way AMI system is already in place,” said Hutson. Gone is any need for the meter to be swapped out if a customer wants to enrol for prepayment. According to Hutson, another bonus is that a thin meter environment can easily support a variety of different meters, either from the same manufacturer or from several different manufacturers. “This greatly reduces the cost per prepaid end point,” he explained. A thin metering environment also makes it easy for utilities to change their pricing or their rating methodology, said Hutson. “In a thick meter environment, each device must be updated anytime a change in pricing or rating methodology occurs. Communication failures with individual devices can cause inaccurate end-user reporting, which leads to customer confusion and distrust of the system.” Hutson added that in some cases it can take days or weeks for the utility to correct the communication problems and get the meters synced properly – and during this time the meter is not rating the usage properly. 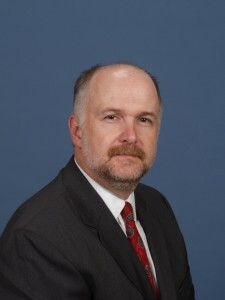 Hutson explained that by contrast in a thin meter environment all calculations are performed at the head-end and customer communications are not interrupted. “If usage information is not received due to a communication issue, an estimate is calculated using the current rates and an adjustment is applied once the actual readings are received,” he said. Mark Day from Z2Solutions, who has worked on both thick and thin metering prepayment projects in the US, thinks the thin prepayment model has distinct advantages for both the utility and the customer. “An AMI-based solution that includes integrated disconnects basically has all customers ‘prepayment-ready’,” said Day. “The utility can deploy AMI ubiquitously and doesn’t have to worry about special or custom hardware (or firmware) configurations.” This, he says, has reduced the cost of providing prepayment, enabling utilities in the US to introduce the service as a value-add to their AMI systems. According to Day, the thin model also gives utilities better visibility and greater control over their prepay programs. Utilities can create more friendly operations policies by prohibiting middle of the night, weekend, or holiday disconnects. They can also suspend disconnects altogether in the event of a significant weather or other event. Additionally, utilities can collect statistics about their customers’ account balances, and the number and length of any disconnects, and so more easily identify any problems. With a thin model, credit status and usage information can be provided via email, text, message or some type of IVR. “What this does is make the information portable and eliminate the need for an in-home display. 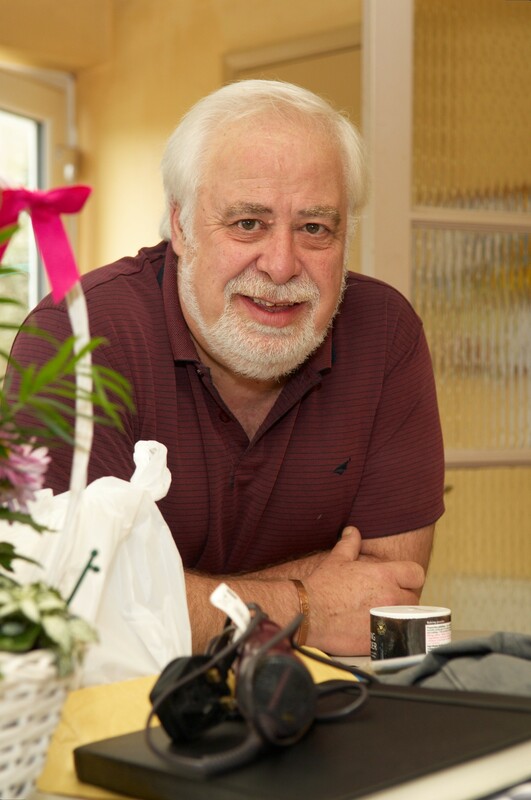 That further reduces the cost to provide the service and makes it more attractive to the utility,” said Day. He added that in his experience there is no significant backlash from customers when moving away from real-time data to periodic data updates with thin systems. With regard to the reliance on communications for AMI-based prepayment systems, Beale pointed out that there will always be situations that can’t be controlled, such as the rare instance of a radio mast going out of service. However, he added that Itron is now offering meters with adaptive communications that incorporate both RF and PLC communications modules, so that there is an alternative communications channel if one network goes down. Beale does not regard self-disconnection as a problematic issue, as all modern prepayment programmes, whether based on thick or thin systems, protect customers from self-disconnection in a number of ways, including giving them access to emergency credit and policies that prevent disconnection at certain times of day. However, he pointed out that thin prepayment systems can provide more information about self-disconnection than thick meters. “With traditional thick meters, data only comes back when the consumer buys more credit. 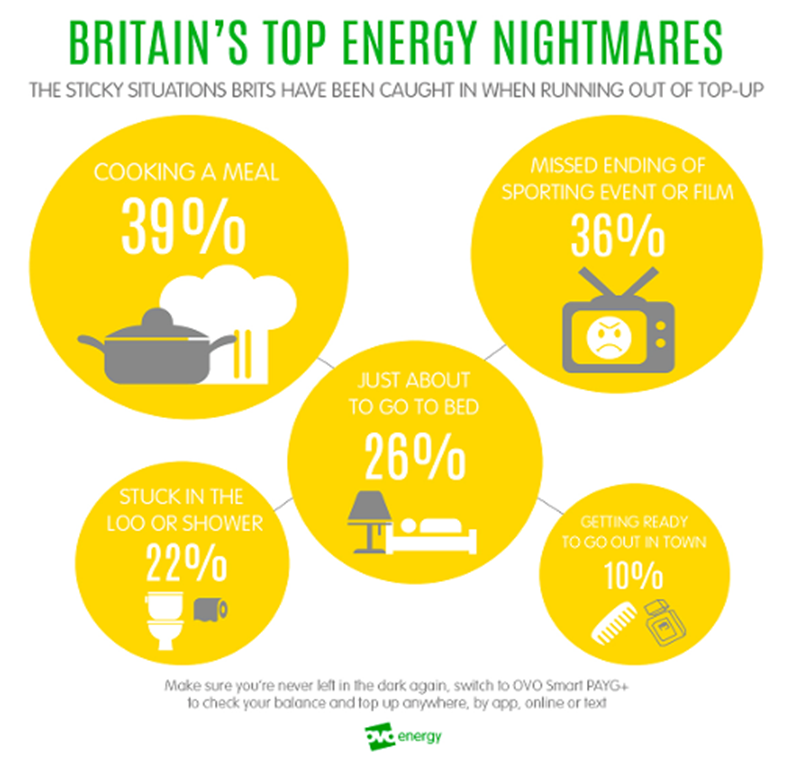 You don’t know what they’re doing in between.” Instead, with smart meters, there is full visibility of any periods of disconnection. In Beale’s view, thin meters would be a better choice if the utility is considering additional services over and above prepayment, such as demand response, outage detection or transformer load management. AMI systems can also support dynamically managed policies relating to disconnection of prepayment customers. For example, the head-end system could send a signal to the meter when the temperature exceeds a certain threshold to prevent customers from being disconnected during an extreme weather event. According to Beale, these types of applications are being increasingly adopted in North America, where there are already large numbers of smart meters. In developing markets, Beale sees the interest centring on enhancing thick prepayment systems with automated meter reading (AMR) to help tackle endemic fraud. “Getting the meter readings back is the first and biggest step,” he said. But Itron can also support utilities who want to start with AMR and then progress towards an AMI system. What’s best for your goals? 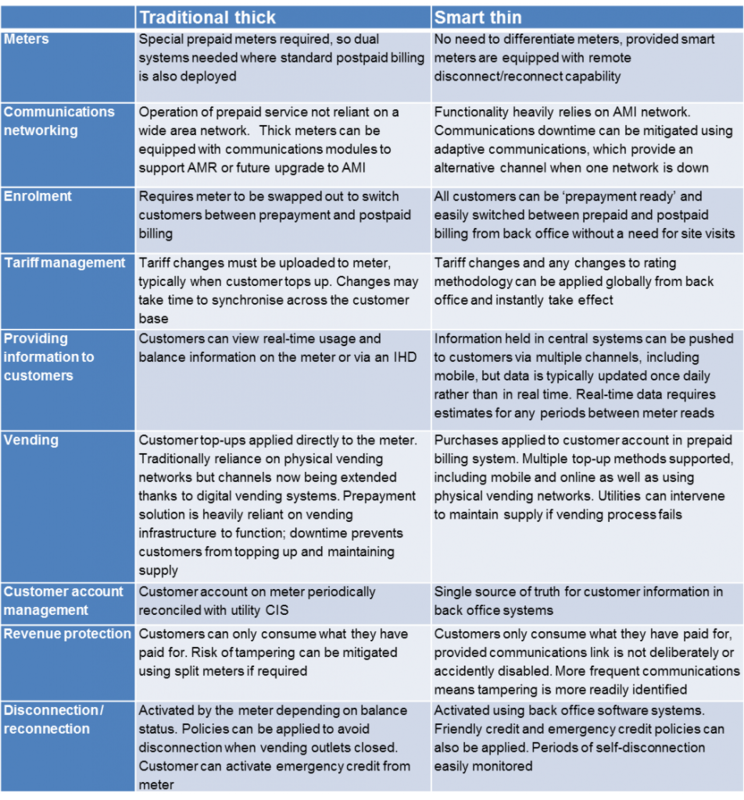 There are clearly some fundamental differences between the traditional thick and smart meter based methods of supporting a prepayment service (see summary table). Which approach is right comes down to the individual circumstances of each utility and any broader policy goals there may be relating to a major metering project (e.g. a requirement to give all consumers access to the same tariffs). If the main aim is to improve revenue collection, there may be a policy of replacing all meters with prepayment meters. AMR could be a valuable add-on, to allow a more sophisticated analysis of consumption patterns, but full AMI may not be justified. This is a typical scenario for many utilities in developing countries. Where AMI is already being widely deployed, then having all meters prepaid-ready can open up new opportunities for a utility to improve debt recovery by encouraging more consumers onto prepayment programs, without any need to run a separate prepaid metering system. North America and parts of Europe could see a real shift towards prepaid utility services in the coming years as advanced metering is rolled out. With consumers increasingly accustomed to prepaying for mobile, transport and other services, energy suppliers can take advantage of smart meters to develop attractive prepayment offerings that fit with modern lifestyles while at the same time improving their business cash-flows. 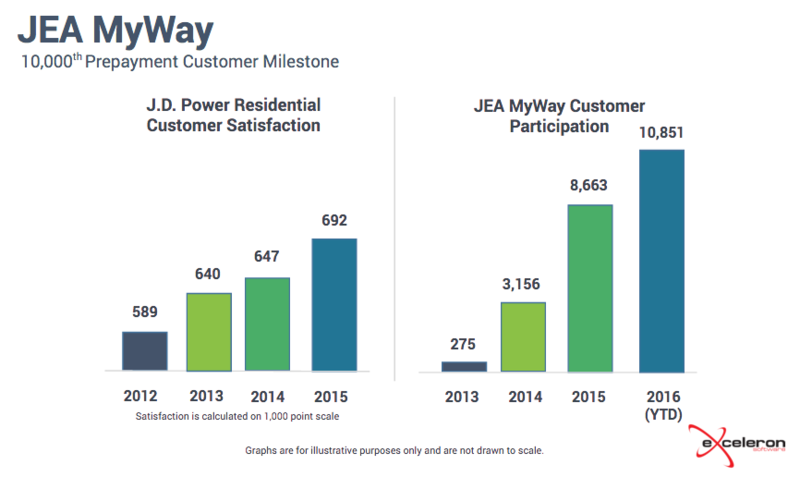 Where the market conditions are favourable, smart prepay could be a win-win for both utilities and customers.